The Barrel Grill with Front Shelf is just the right size for your patio to fix your family a great meal. This grill has ample cooking area with 558 square inches for cooking including a warmer rack built into the lid. The large front shelf is handy for keeping your spices and food within easy reach. 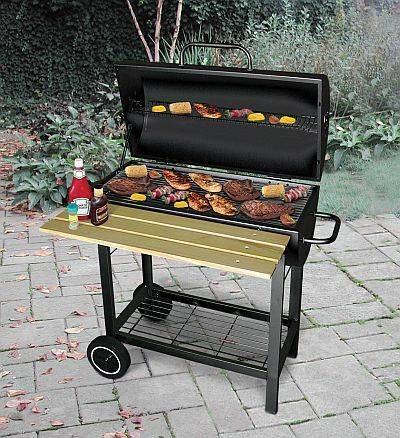 This charcoal grill is made from heavy duty steel with wheels for easy portability. There is also a storage shelf on the bolttom to keep your larger items. If you are looking for a general purpose grill that can do it all, this barrel grill can do the job.